NGJ | Why Not Train A Child? The Gentle Christian Mothers are discussing NGJ’s New Addition to “To Train Up a Child.” It seems that for their 21st anniversary edition, No Greater Joy has added a new chapter to the book which attempts to refute studies which showing spanking to be detrimental to children. Of course, the moms at Gentle Christian Mothers have found a few flaws in his logic. If you like this, you might also be interested in this list I complied of Selected posts from The Gentle Christian Mothers Forum. Michael Pearl has released an official statement on the tragic death of Hannah Williams on his No Greater Joy Facebook Page. This time he is not laughing. He explains that he tells parents not to abuse and gives some quotes to back that up. He didn’t even quote where he said not to use punishment on a child who has medical issues for not obeying, which I consider to be his best defense. However, I do not agree with him that anyone can follow his advice without being abusive, as he and I do not agree on our definitions of abuse. In fact, he never actually gives his definition of abuse, which is part of the problem. He says not to abuse but never tells them how far to go (other than to be 100% consistent) nor what constitutes abuse. Then, every time someone crosses the (invisible) line, he blames them for not doing it correctly. We share in the sadness over the tragic death of Hanna Williams. What her parents did is diametrically opposed to the philosophy of No Greater Joy Ministries (NGJ) and what is taught in the book, To Train Up a Child (see quotes below). We are grieved by Hanna’s death as well as the nearly 1,700 other children that die in this country every year as the result of neglect or abuse. This is part of the motivation of NGJ to provide materials that are helping parents to raise healthy and happy children. Here are quotes from the book that actually warn against abuse. These quotes and the rest of the book are about turning the hearts of parents to the children and the hearts of children to the parents. If, as alleged, Hanna’s parents owned a copy of the book, it is obvious from these quotes and their actions, that they either have not read it or totally ignored its contents. The book repeated warns parents against abuse and emphasizes the parents’ responsibility to love and properly care for their children, which includes training them for success. There are thousands upon thousands of parents (the book has sold over 660,000 copies) who have and are properly applying the philosophy in the book with the joyous results of happy, productive, well-adjusted children in loving successful families. The alleged presence of the book makes it no more responsible for Hanna’s death than the presence of a weight loss book in the home of an overweight person is responsible for their obesity. Its presence is actually recognition that there was a problem and obtaining the book was an effort to solve it. Unfortunately, if Hanna’s parents own a copy they chose to ignore (or twist) the contents of the book that could have corrected their poor parenting and prevented the abuse and her death. It is our desire to redouble our efforts to help families and to prevent future tragedies. He is wrong about the Williams obtaining the book in an effort to solve the problem. They were using the Pearls’ materials for years before they adopted Hana and Immanuel. I don’t know how long ago they last read the book, but I have said many times that they twisted the advice therein. The only reason I link the Pearls to this tragedy at all is because of their Parents Must Win Every Battle At All Costs mindset which I feel could have something to do with the Williams’ need for control. I suspect that after all those years of Perfectly Obedient Children resulting from following the Pearls’ teachings, the fact that they were unable to get results from their adopted children pushed them off the deep end. I could be wrong, but this is how it looks to me. I thought that back on Sept 6 and the more I learn, the more it looks that way. beatenwithplumbingline has just started a new blog called, No Greater Joy? The first, and so far only, post shows how the Pearls’ teachings violate Matthew 18:2-6. (Note, this site has since been deleted) This post also states the purpose of the new blog which is. 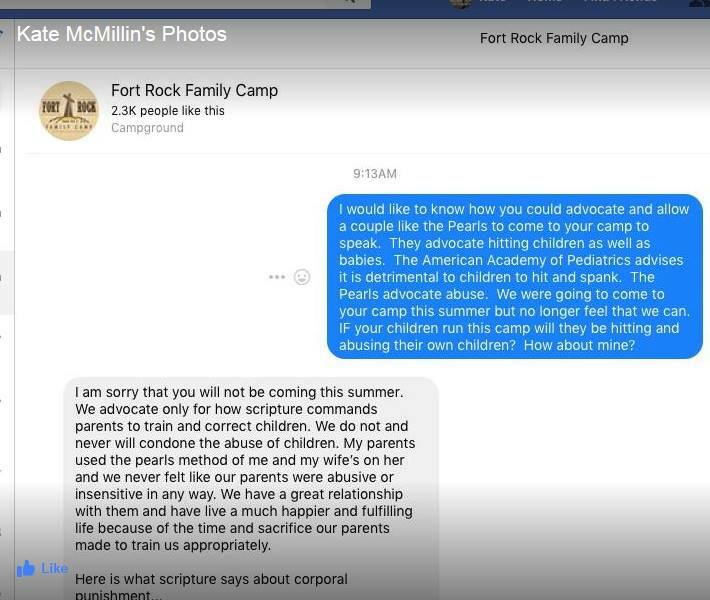 …to warn parents, pastors, and law enforcement of the dangerous and abusive parenting methods of Michael and Debi Pearl, as presented by their webside “No Greater Joy” and espoused in their book To Train Up a Child. Another purpose of this website is to preserve the memory of the children who have died at the hands of parents who abused them using Michael and Debi Pearl’s methods. The blog contains 2 links, one to a news article about the Schatz story and the other to a news article about the death of Hana Grace-Rose Williams. What does her death have to do with the Pearls’ teachings? Probably nothing, but it remains to be seen. I have heard murmurings on the internet that her parents were Pearl followers, but it is all officially hearsay at this point. Here is another article about Hana Grace-Rose Williams which includes a News Video from KomoNews.com and here is an article from Fox News which mentions that the family homeschooled all their children.